Teaching Kids Safety in a Fun Way! Naperville Safety Town is a delightful miniature community run by the Naperville Junior Woman’s Club, with support from the Naperville Police and Naperville Fire departments. The pint size town is complete with streets, sidewalks, tiny buildings, working traffic lights and a railroad crossing gate, a full-size caboose, and vehicles. "Young children learn about safety first hand!" A classroom is also present, and a wonderful 911 teaching system where little ones can practice the proper way to make emergency calls. 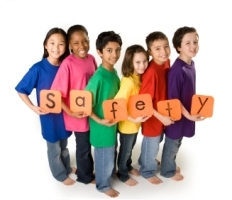 Safety education programs are held every summer for children ages five and six. The classes cover a variety of topics, such as pedestrian, bike, fire, railroad, bus, animal, and personal safety. Safety instruction is NEVER boring at Safety Town! Interactive games, stories, songs, and videos are used to keep kids engaged. Throughout the year, there are classes for all ages on different safety topics including CPR, bike safety, babysitting, senior citizen crime prevention and self-defense. There are also special programs for Brownie and Junior Girl Scouts, and Wolf and Webelo Cub Scouts to help earn requirements towards safety badges. Information and registration forms are available on the Naperville Junior Woman’s Club website.